The Computer is My Friend - I mean the Internet! Home Albanian Blogger The Computer is My Friend – I mean the Internet! 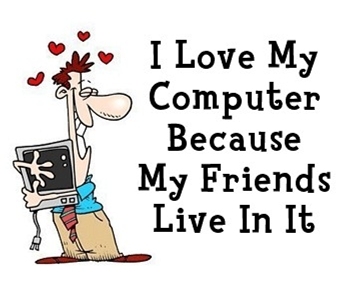 The Computer is My Friend – I mean the Internet! A friend of mine sent me this nice little picture on Facebook, which for me is true in many ways. It is true because, as many Albanians and I have discovered, the Internet and social sites like Facebook are the new meeting place even for those who live in the same country as much as those living abroad. Moreover, this trend with social sites like MySpace, Facebook, Hi 5, etc, has really caught on with the Albanian youth and their numbers online are increasing steadily. Another advantage to this is the fact that they are learning to use the tools of tomorrow and hopefully learn to use them for their good and the good of this country. How do I know Albanians are visiting these social networking sites, well I am one of them and I find many of them there too.